The Bristol Bay area consists of all waters of Bristol Bay including drainages enclosed by a line from Cape Newenham on the west side to Cape Menshikof on the Alaska Peninsula on the east. This is the shallowest area of the Bering Sea. Pilot Point village at the mouth of the Ugashik River on the Alaska Peninsula is the most easterly coastal village and Togiak at the mouth of the Togiak River is the most westerly coastal village of Bristol Bay. 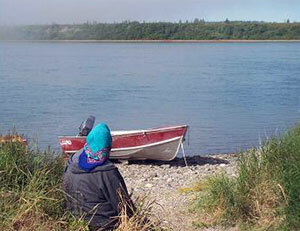 The major rivers flowing into BB from east to west are the Ugashik, Egegik, Naknek, Kvichak, Nushagak and Togiak. The lower reaches of all streams that terminate at the Bristol Bay coast are subject to substantial tidal fluctuations. Bristol Bay is the home of the eighth largest tide in the world. All five species of Pacific salmon return to Bristol Bay to spawn. All salmon species do not return to every watershed and pink salmon return to spawn every other even numbered year (2010, 2012, etc.). Dillingham, Naknek, King Salmon, Togiak, New Stuyahok and Manokotak are the larger communities in Bristol Bay with populations over 300 people. Other communities in Bristol Bay not previously mentioned are: Ugashik, Egegik, South Naknek, Levelock, Igiugig, Iliamna, Kokhanok, Pedro Bay, Newhalen, Nondalton, Port Alsworth, Koliganek, Ekwok, Portage Creek, Aleknagik, Clarks Point, Ekuk, and Twin Hills.